A big thank you to my fgm in Poland. I was very surprised to get her wonderful package today. 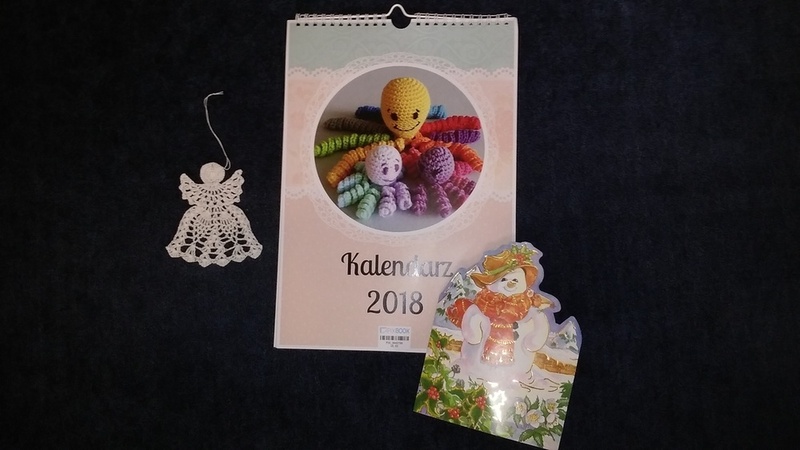 She made a calendar using photos of some of her beautiful projects. Its like getting a hug from her every day. She sent a cute card with a note inside explaining the name day celebration custom in Poland. She also sent me one of her thread angels-----so pretty. I cant tell you how much I had been admiring the photo of one she posted. i guess my two posts got cleared but would like to thank ny fgm in tx for the beautiful little butterfly and sweet card and my fg in in Ma for a new clover j hook thank you!! No I did not start a new thread. This is one from when things were messed up. Post thank yous here. Sorry my mistake. I thought that thread had been moved. Clearly I was wrong. However, her posts didn't disappear they did appear on the other thread. With all the craziness going on it it worth knowing something wasn't lost it was just posted on a different post. I thought I'd lost something the other day only to realize I'd posted it on a different thread than I realized. In that case it was all on me, but I was trying to figure out why it was lost and when I found it I realized it wasn't a board glich it was me misposting. Hey Chris no problemo. It certainly has been confusing and challenging. Terri was going to try to tidy things up so it wouldnt be so confusing but things still are not right and it resulted in the deletion of the wishlist.